This complete bed in a package is more than I expected.Its high quality material and whimsical unicorns are precious.It comes with a matching pillow case and 2 decorative pillows.I highly recommend it. Fill your bedroom with the sweet and whimsical charm of the Urban Habitat Kids Ella Cotton Printed Comforter Set. Adorable unicorns prance across the top of the comforter and matching shams in bright colors on a pink/ purple ground. The solid purple/ aqua reverse highlights the fun print making it pop! Completing this 100-percent cotton comforter set are two decorative pillows that feature pleating details and an applique unicorn, for a magical finishing touch. Hypoallergenic filling in the comforter and pillows provide rich softness and comfort. Machine washable for easy care, this child's cotton printed comforter set will brighten your bedroom with its fun and playful look. Dimensions 88.0 In. X 88.0 In. X 1.0 In. Super cute! After I washed it the material was super soft and comfortable! I love the two decorative pillows that come with it! I would recommend this comforter set! I wanted to love this bedding. I like it, but it has some issues. My daughter is crazy about unicorns and there are unicorns a-plenty on this bedding. After waiting for what seemed like forever (somehow, the product made a detour halfway across the country before turning around and eventually arriving at my home a week late), I opened the package today. The colors were not as vibrant as in the photo. I washed all the items inside and everything came out so very wrinkled (the color didn't fade from washing -- looked the same before and after). The worst were the shams. I ironed pillow shams for a 4-year old, and I hate ironing -- the wrinkles were that bad. Up-close the purple and teal were a bit upstaged by the textured fabric, looking sort of faded. Also, the comforter (queen-size) barely fit in my XL front-load washer and dryer. The dryer door kept popping open. Maybe this should be dry-cleaned, but for a kid's bedding set, it really should be machine washable. I have always washed my king comforters at home, so I figured I'd have no trouble washing a queen. One more thing -- the white toss pillow is made of a very thin fabric, so you can see the stuffing through it. This wouldn't be an issue, but the stuffing is not a uniform white color, but instead has bits of darker colors. The result is a white toss pillow that's sort of translucent, filled with visible clumps of different-colored stuffing. We wont be using that pillow. The other toss pillow is adorable, though. Such a nice set for a toddler/kid room. Love the cotton option as well. The colors are beautiful and it is comfortable warm. Comforter looks great with different color beds as well - white, beige, brown. Just a nice color combination that goes with all room styles/colors. 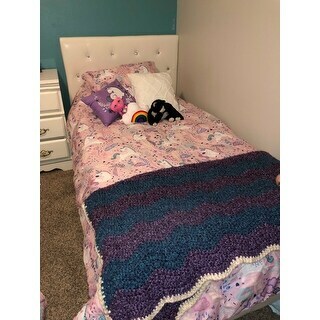 My 6 year old daughter LOVES this purple unicorn comforter!!! The colors are bright, adorable design, very soft and she especially loves the pretty matching pillows! My three-going-on four year old LOVES her unicorn-themed room, and this comforter set is her favorite! It couldn’t look more adorable in her room. Also, the decorative pillows are a welcome bonus and definitely add the perfect finishing touch to her bed. I do like how the comforter is reversible, although for now my daughter prefers to just have the purple side up. Happy daughter, happy parents! So cute! Thicker comforter too and has super cute decorative pillows. My 4 year old absolutely loves her new bedding. I would definitely recommend this comfort set. Very cute and comfortable. Nice print, beautiful colors, just perfect. Goes perfectly for the unicorn room. Got it quickly. Made very well. My daughter loves this set! The comforter is plush but not over filled, the throw pillows are really nice, the details are great! And even better the colors look just like the pictures online, so there were no surprises. Cute set! High quality and just adorable. Highly recommend for a unicorn-obsessed child like mine. I ordered two of these for my daughters new room and they both came but one of the sets was missing the sham. Frustrated that I’ll now have to most likely pack it up and send it back to get a replacement. They’ve been excited about their new bedding for several weeks. Very nice product, quick shipping! Material was soft and great quality, came with very nice pillows! I love the unicorns. I am 68 yr old widow and they make me very happy, would love to find curtains. Well made. Beautiful colors just like the picture. Accent pillows are adorable. Looks great in my daughters unicorn themed room. The colors are brighter than in picture. We got it for our granddaughter. Cute as can be! It looks great with my granddaughter's pink wall bedroom. It has held up after its first washing. "What color is the green on the inside of the comforter in the urban habitat with the unicorns? The outside has white unicorns with purple and other colors like green and blue." It is solid green. I hope this helps.